Travis, a former racing horse suffering from multiple tumors, underwent successful sound and vibration therapy using holistic treatments during a demonstration Sunday. 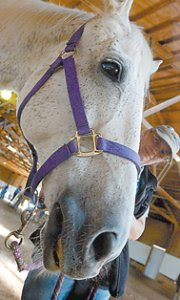 A floppy lip, glazed eyes and droopy ears are positive signs of a relaxed patient, Sheri Antrude of Concord Township said. “He likes this,” said Travis’ owner Stephani Kames, who also owns Fox Creek Stables, where the demonstration occurred. LAKE TWP. “Travis” is an old boy. A former racehorse, he desires to run endlessly, but his body cannot. At 27, the gray thoroughbred has many tumors. But Travis has found relief in touch. “He likes this,” said Stephani Kames, who owns the aging horse, which was taken to Fox Creek Stables in Lake Township. Fox Creek is owned by Jill Kirsch. Kames watches as tuning forks – gently applied – vibrate and tingle on the horse’s back, chest and ears. Travis passes gas. His lips become droopy. His head lowers. He has found his chi. Carol Komitor, founder and director of Komitor Healing Methods, taught holistic touching techniques – to help heal and/or calm animals – to a group of students Sunday at Fox Creek. The four-level program is known as Healing Touch for Animals (HTA). Using tuning forks is just one application. “When you keep the energy system in balance it allows for a deep relaxation to come in, and when we’re relaxed – whether it is people or animals – it allows for correct physiology,” Komitor, a former veterinary technician, said. She said holistic therapy can help heal general illnesses, stabilize training, reduce anxiety and behavioral issues and regulate the immune system in animals. She sees the therapy as a partner to medicine. Pamela Fisher, a local holistic veterinarian, organized the event. Her practice is in Jackson Township. She has more than 500 clients. “I was drawn to (the program) because I do energy work in my office,” Fisher said. Energy work is another term for holistic therapy. Fisher said the program is a “wonderful avenue” to teach holistic techniques to her clients. One of her clients is Cindy Van Allen. Van Allen, a Butler resident, has two epileptic dogs. The seizures were daily. Van Allen said the holistic techniques have helped calm her animals and reduce the amount of seizures and other epileptic side effects. With touch therapy, “an owner can see immediate differences,” in their pets, she said. Candace Phillips of Hartville is another client. She is a massage therapist. She owns two horses, three cats and three dogs. She said the “energy work” of holistic treatments can identify a problem quickly and set you on a path toward a solution – medical or otherwise. “The body will tell you a thousand times something is wrong before it becomes a problem,” Phillips said. Komitor’s holistic therapy for animals has attracted students from many countries. Joining students, such as Phillips, were twin sisters from the Netherlands. Ria and Henriette Roosendaal train horses for competition in the Amsterdam area. They made the trip to Lake Township so they could complete their education. “It is our self-healing that helps healing, not someone else,” Komitor told students.